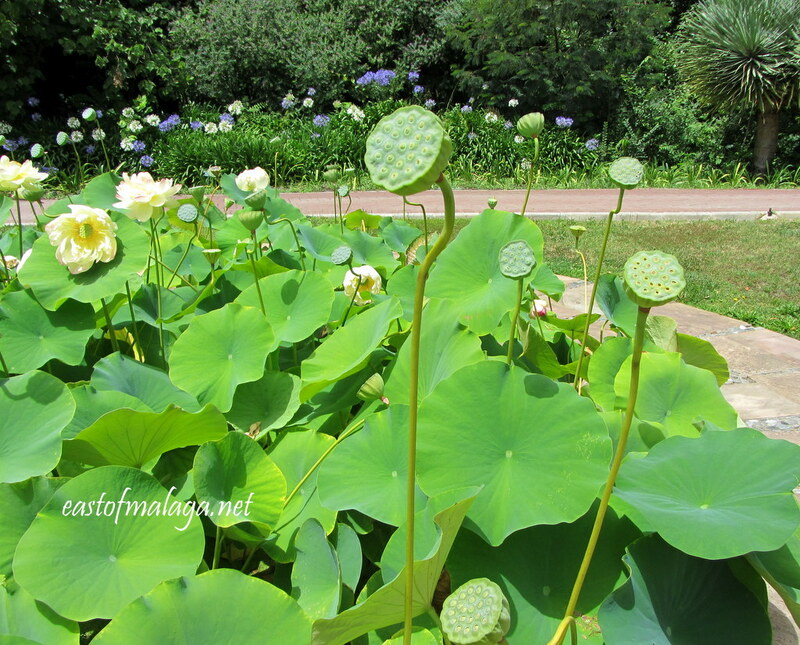 Málaga´s Botanical Gardens: Can you dig it? Botanical gardens around the world are often well worth a visit while travelling, and Málaga’s La Concepción Gardens are no exception. 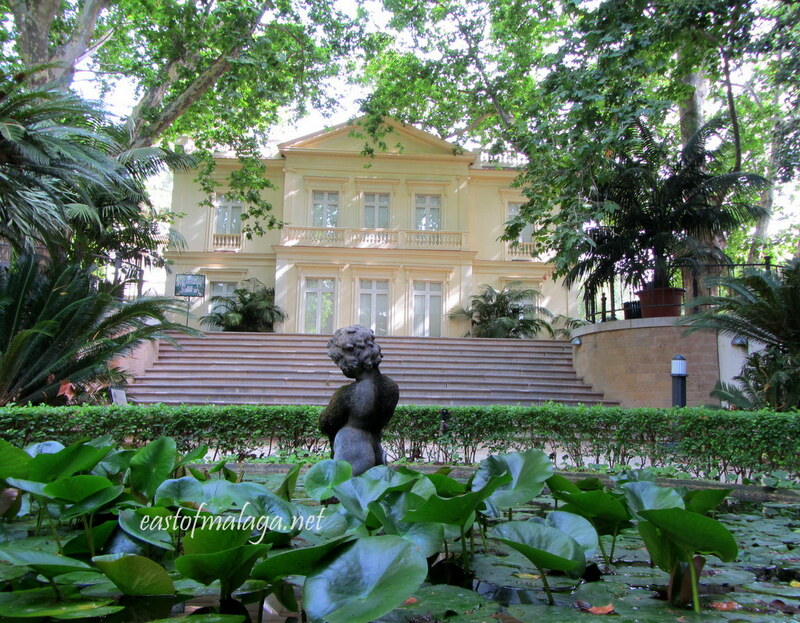 Just to the north of the city, the stunning Jardín Botánico-Historico La Conceptión has justifiably attracted a reputation for being amongst the best in Europe. The gardens were founded in 1850 by Amalia Heredia Livermore and her husband Jorge, the Marquis of Casa Loring, who travelled the world in search of tropical plants for their garden, in the centre of which they built an Andalucían mansion, complete with indoor courtyard. 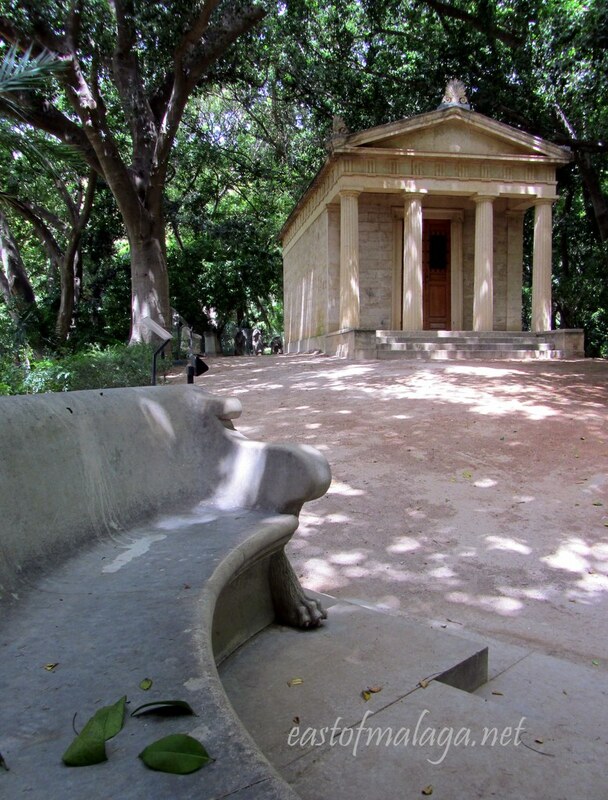 During the Loring´s occupation of the property, Finca La Concepción was well known for the dinner parties which took place in the Wisteria Dining Arbour, often followed by short walking tours of the gardens. At the time of our visit, the Arbour was being prepared for a wedding, which must be a particularly spectacular setting in April each year, when the wisteria is in bloom. 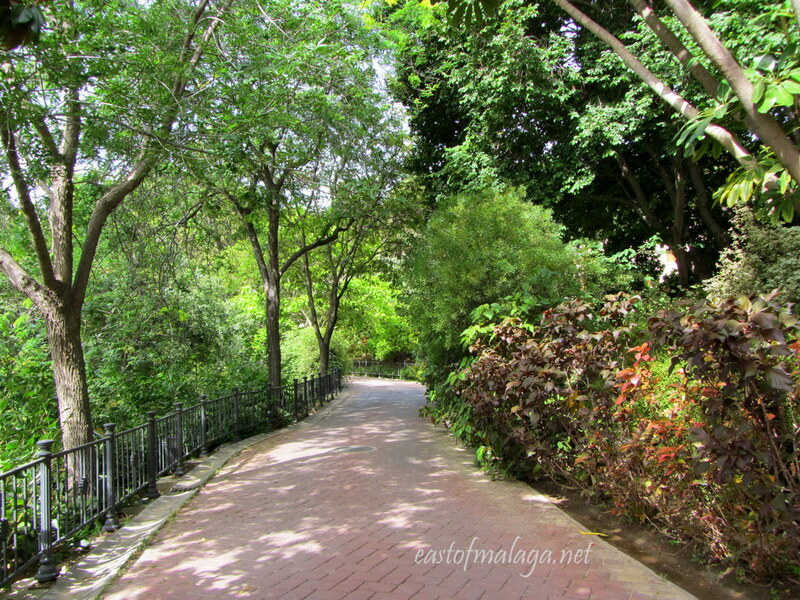 Jardín Botánico-Historico La Conceptión was declared a historical and artistic garden in 1943, but fell into decline over the years until the garden estate, comprising 49 hectares of established gardens and surrounding forests, were acquired by Málaga City Council in 1990. Following an extensive programme of renovation, the gardens were opened to the public in 1994. 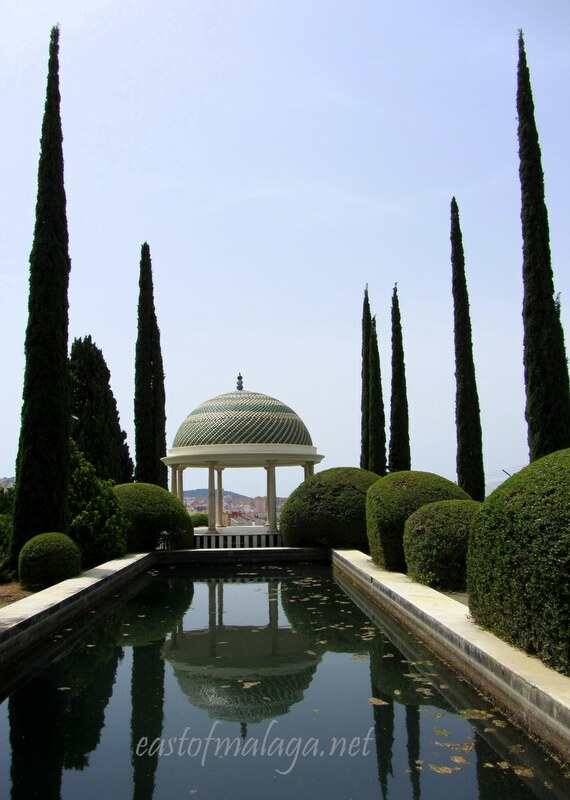 As well as many thousands of plant and tree specimens, architecturally the gardens also contain a few memorable buildings such as the finca, a Doric-columned Museum of ancient Roman sculpture, a number of small bridges crossing waterways, and an Alhambra-inspired pool with pagoda, offering great views over Málaga city. Even on a hot summer´s day, it´s a pleasure to enjoy the cool green shade and occasional sprinklers which may catch you by surprise as they irrigate the surrounding plants. 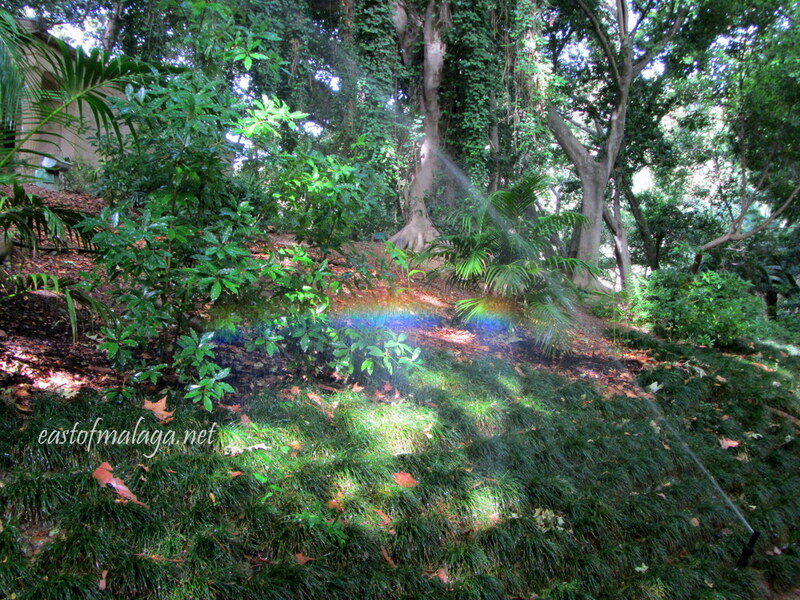 I was delighted to even capture a rainbow dancing in the water droplets. The romantic, landscaped design transports you to a tropical paradise filled with waterfalls, streams, carved benches, lily ponds and thousands of plant specimens from all over the world. Add to that the beautiful sound of birdsong, turtles, frogs and the occasional squirrel looking for something to eat, and you have found yourself a very pleasant way to spend a sunny morning. We took about three hours to wander around the gardens, which includes the impressive “Around the World in 80 Trees” exhibit, showcasing trees from every continent. To find the Botanical Gardens (driving from the Axarquía, east of Málaga) take the Autovía towards Málaga, turning onto the A45 before the city, towards Granada, Córdoba and Seville. After only a kilometre or so, you will see signs for the Jardín Botánico-Historico La Conceptión. Exit the A45 at km 140 and follow local signs to the Gardens. For further details of opening times and entrance prices, visit their website. 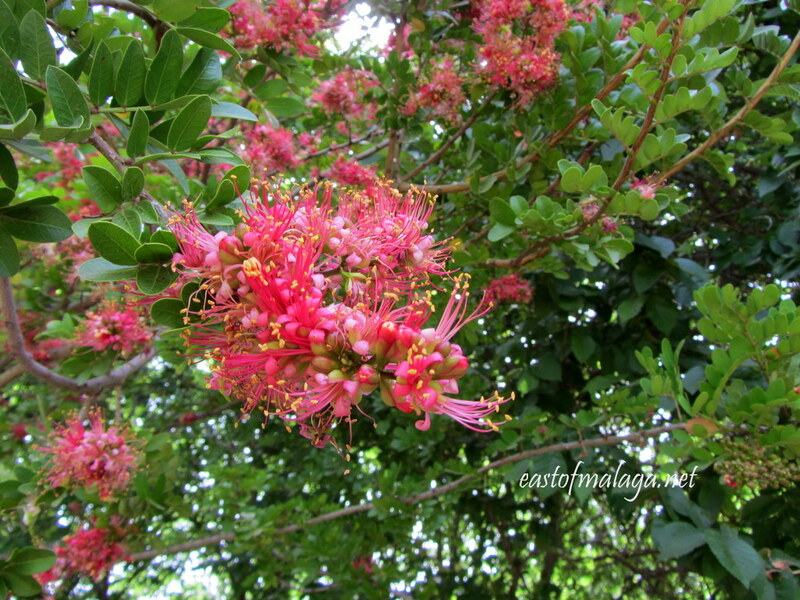 This entry was tagged Andalucía, East of Malaga, Europe, flowers, garden, gardening, Malaga, photography, Spain, travel. Bookmark the permalink. What a gorgeous park! 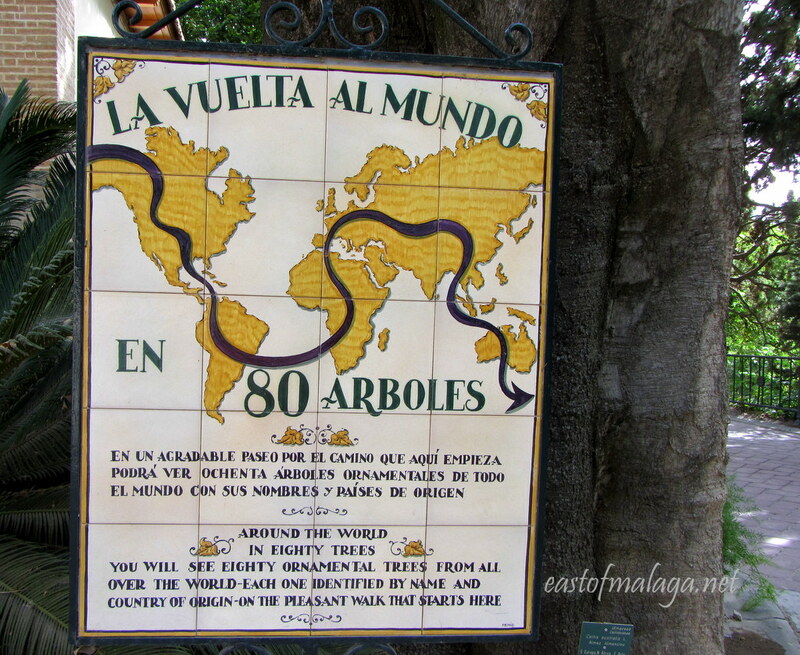 I love the Around the World in 80 Trees, that’s really creative. Even on a really hot day, there are always shady places, and pools to keep you cool. What a fabulous place to have created ….thank you for taking the time to share this with us – wonderful! That’s a pretty awesome place, M – I’m sure you could lose yourself there for hours on end! I like the paw leg of that bench – best not ask where the rest went. This blog overflows with great posts one after another. The best SET of images you ever had, Marianne. Awesomely framed images, and at the same time, not spoiling to capture the essence of the place. Splendid! Thanks Rommel, what a wonderful complement. I truly appreciate your comment. It’s time to (re)visit these gardens! They are really really spectacular. The Facebook avatar that I have features my adorable little kiddies hugging each other (now, they are boys, so you can imagine how hard it is to actually catch them HUGGING each other!) in this garden. I was in Córdoba on Monday and Tuesday this week! We revisited the Mezquita, Roman Bridge and also visited the Alcazar. We had a great time 🙂 I LOVE Córdoba. 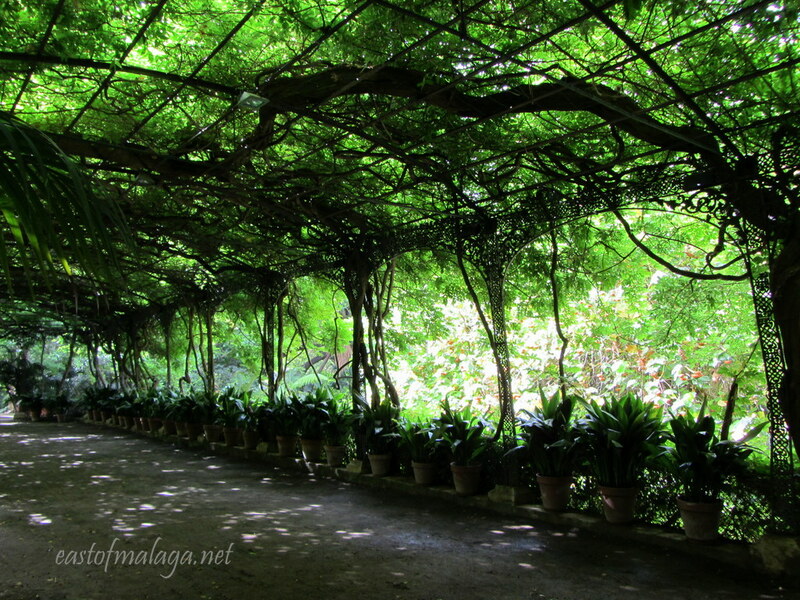 I keep running out of time when I’m in Málaga, but will plan a longer visit for next spring just to see the gardens. Great pics. Noted! Though I’ll try to get down again before then too. Spent four days in Málaga in September – much too short. It’s my second favourite city in Spain. It looks like the most beautiful place to meander. The covered arch with it’s lovely green is very cozy. The waterfall is where I would be. The water falling creating a musical peaceful song would be breathtaking. Exquiste photos …. ….and these are only a few of the photographs I took. There are many such waterfalls and pools throughout the gardens. 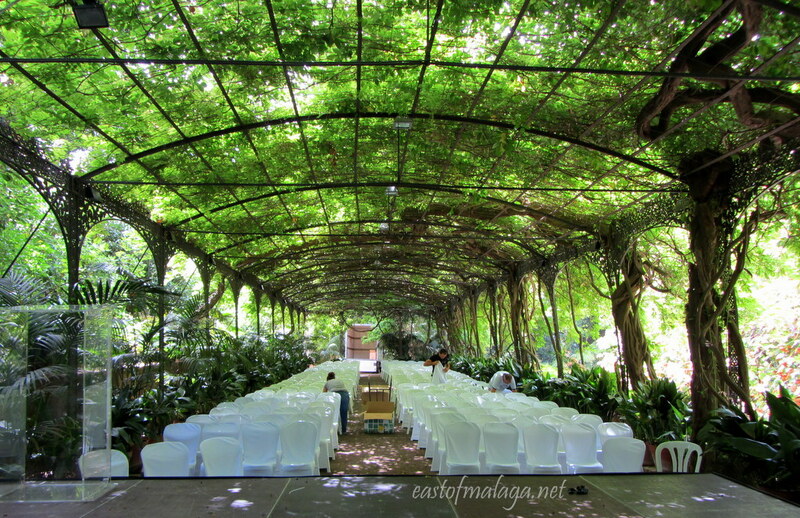 The most spectacular thing for you to see, Isadora, would be the Wisteria covered Arbour where the weddings are held. Absolutely amazing! It’s pouring rain here- what a nice lift! Yet another reason to come back to Malaga! I love botanical gardens with their hidden paths and secret bothies. Your photos are wonderful – the little waterfall and round pavilion are gorgeous. Great places to take kids, too! Absolutely beautiful…stunning pictures of an amzing place!! Have a great weekend! Such gorgeous photographs! 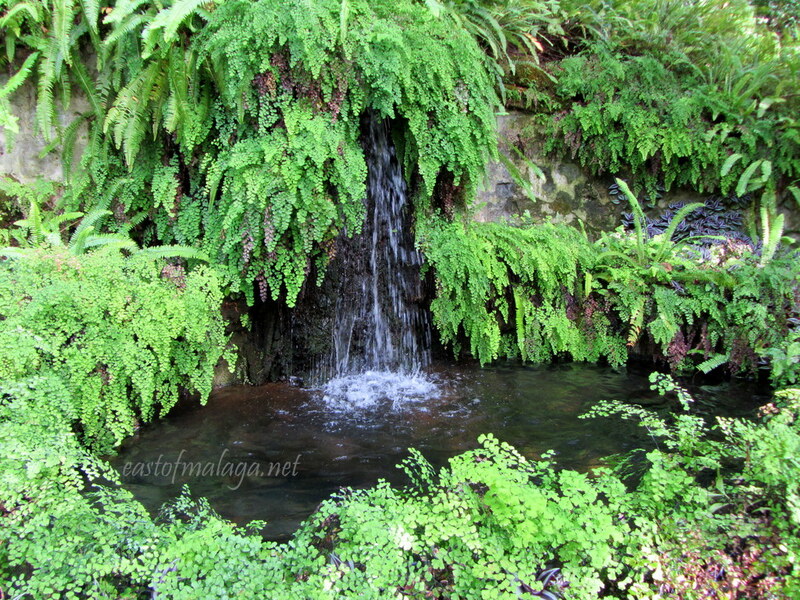 I especially love the pool surrounded by ferns – so peaceful! It was so difficult to choose which photos to publish – I had too many! One of the things I loved about the gardens is that there were lots of quiet, peaceful areas – and such diversity throughout the gardens. Botanic heaven – what a lovely phrase – but yes, this is it! I always appreciate your comments, Angelia, thanks. wow!! another place I need to visit 😉 Is there any public transportation that goes there? 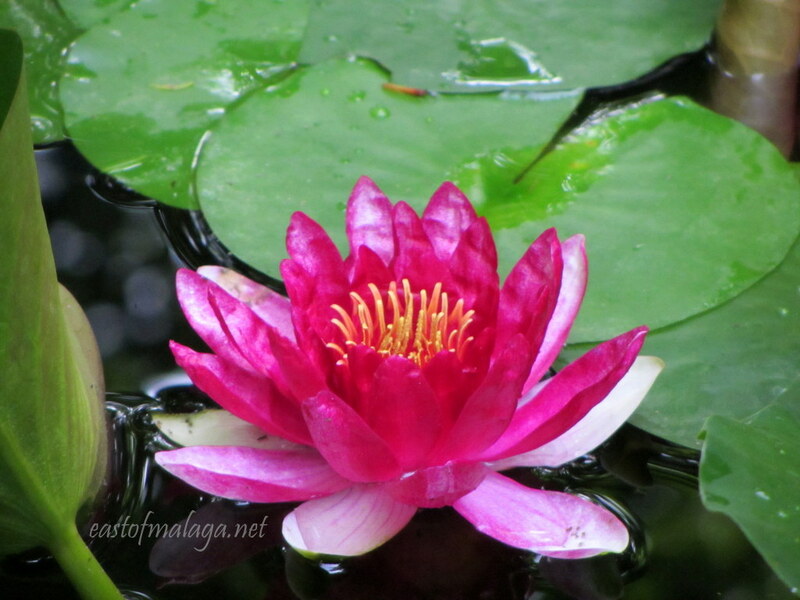 LOVE the photos, and most especially the one of the water lily. beautiful!!! I´m sure you would love visiting the gardens. 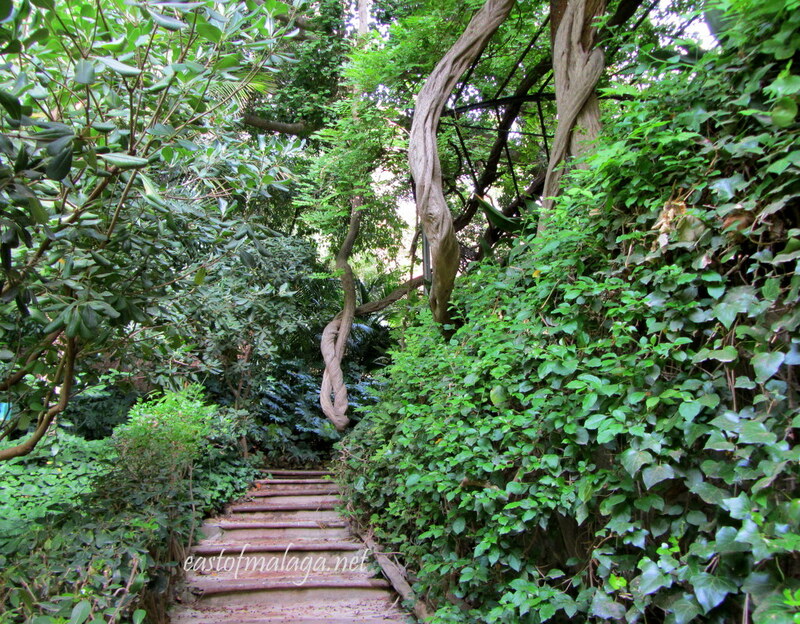 I love exploring Malaga and its surrounds through your posts. Lovely photos! 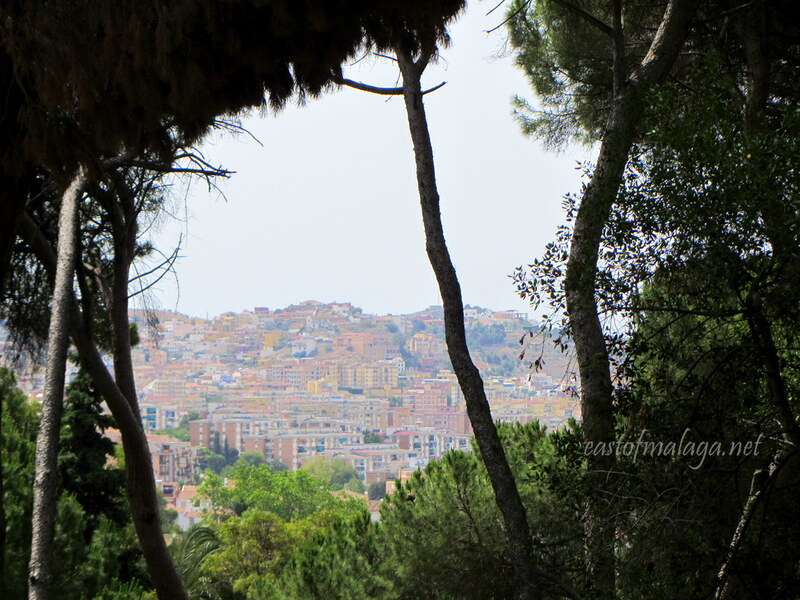 I love exploring Malaga and its surrounds through your eyes. Lovely photos! It was a real unexpected gem to find 🙂 Thanks. What a beautiful looking place and a wonderful selection of photos. I did, I love a nice garden and that is a corker! Great photos, what a gem of a place! Thanks for your comment and your continued support of my blog. Much appreciated. Thanks Coreen – I really appreciate that, coming from such a great photographer yourself. If I wasn’t already married, I’d love to have my wedding in the Arbour, especially with the wisteria – pretty and a lovely smell. Great photos, and much better than Parc de la Ciutadella if these pics are anything to go by. I still love that place and have spent many happy Sundays there but I don’t think there’s as much variety. I would imagine there is a long waiting list for weddings in the wisteria-filled arbour! Can you imagine the photographs though? You’re right about Botanical Gardens being great places to visit, worldwide. Sad to say, when we’re young and foolish, we often bypass them which is why I didn’t even know these stunning gardens existed! I hope you’ll put a reminder in your diary for April so you can show us the Wisteria Arbour in all its glory – what a place for a marriage! You’re not there full-time, then, Marianne? I totally dig it! What a beautiful and romantic spot. I had been meaning to visit the gardens for the past few years, but for some reason never got around to it. I´m so glad I made it! Amazing … so astonishingly beautiful -:)! Thank you for posting such wonderful photos, I loved it -:)! Thanks Daniela, I´m glad you enjoyed it! Aren’t they wonderful? I went pre digicamera days. Sadly!! Did you get to go inside that strange building (fifth pic down)? When we went round it was organised tours only (in Spanish surprisingly) but we got some great info and we were told the little building wasn’t normally opened. We got the bus from the city, around once an hour I think. That´s the Museum of Roman Sculptures which was closed when we visited, too! There were lots of large Roman relics outside to one side and around the back of the building though – including an impressive mosaic pool. This looks absolutely lovely … reminiscent of Barcelona’s Parc de la Ciutadella at times, but with a better selection of plants! Sadly, I haven´t visited Parc de la Ciutadella yet (maybe next time I´m in Barcelona), but Málaga´s Botanical Gardens are an absolute delight. Thanks for taking the time to comment, Simon.